That’s a much easier phrase to preach than it is to live, right? To be completely honest there are days I simply want to throw my hands up and say, “I’m done, I’m tired, I’m weary, and I just don’t want to do this anymore.” But it’s in those moments I am reminded of all Jesus did for me. What if he had said, “Father, I don’t want to do this anymore.” and just walked away? Well, will I trust him? God has good plans for me and you! They may not always be the plans we have in our minds, but they are good! So, we have to decide to trust him (even when things aren’t easy), keep our faith (even when life seems to throw so many bad things in your path you wonder how you are going to get past them), and remain thankful (because we always have something to be thankful for, even if we are going through a storm). God is always working in every area of our life, even when we can’t see an end or solution in sight. It’s all about trust and when we feel weary from trying to get through the day, from trying to get through the sickness, from trying to get through the piles of bills, he is there waiting on us, ready to renew our strength and our faith, but we have to let him. Life isn’t going to be full of rainbows and glitter every day (oh how I wish it would rain down glitter, that would be amazing). Somedays it will feel like we are on a tiny boat in the middle of the ocean during a hurricane, but we have to trust and lean on God. 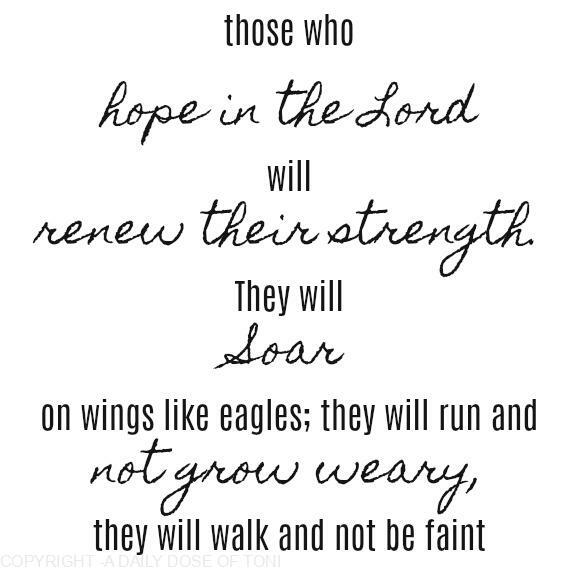 He is how we are going to stay strong and not grow weary in life and all its ups and downs. He has to be our strength and our refuge. He wants us to rely on Him, he didn’t create us to do this life thing without Him. So, today, take time to replenish your soul and let God strengthen you. Because if you are anything like me, today, you need it. In fact, every day I have to let him renew my strength, but I wouldn’t have it any other way!